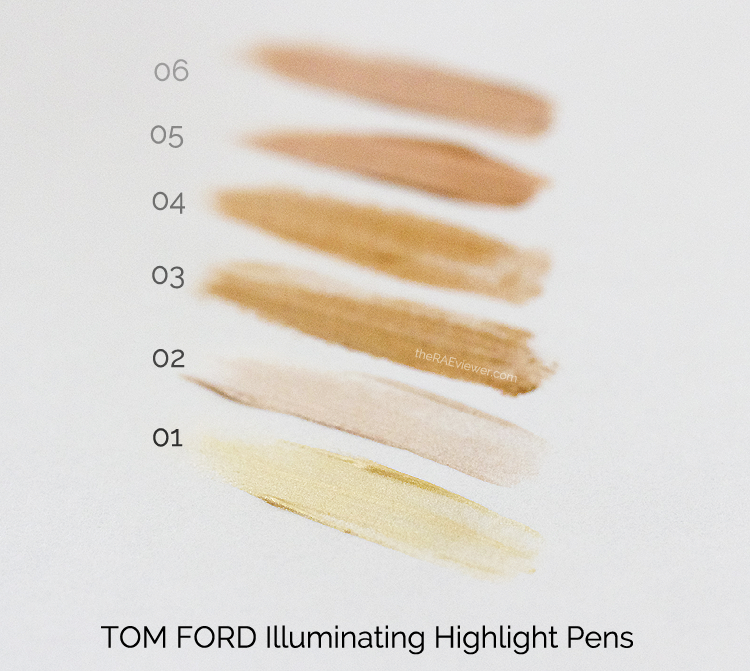 Tom Ford released his new Illuminating Highlight Pens last year, but I have only just been able to experiment with these dreamy, versatile products. There are shimmery and matte shades, available at Neiman Marcus or Bergdorf Goodman, all swatched and described toward end of the post. Click below to see more photos! From Harrods.com: Tom Ford believes in balance and symmetry. 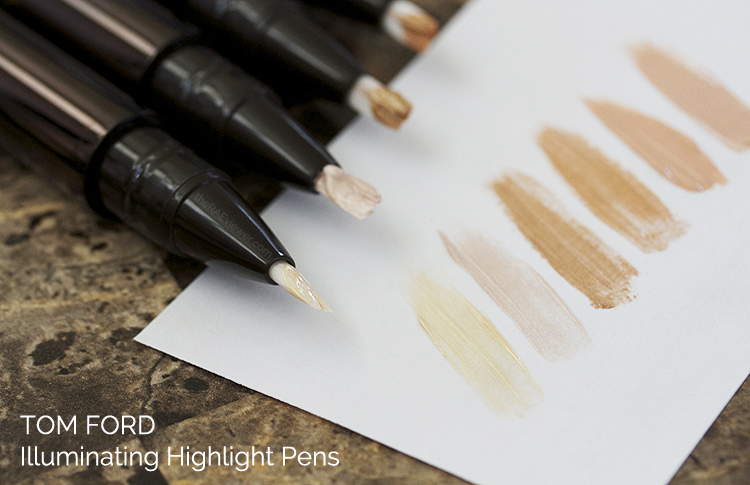 The illuminating highlight pen allows you to enhance, contour or diminish your features to create the appearance of symmetry. 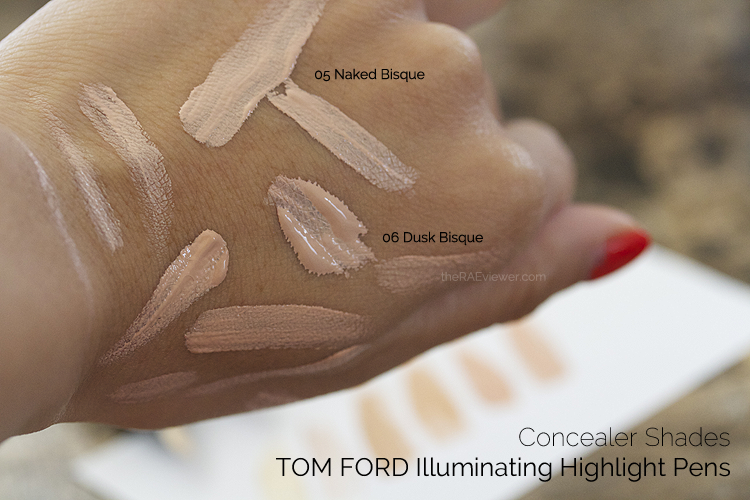 The range includes eight highly micronized shades: four tones that catch the light and bring focus to the cheekbones and eyes to create balance and symmetry (Citrine, Lavender Voile, Peach Blush and Liquid Bronze) and four tones that act as skin-priming concealers to diminish flaws and shadows (Naked Bisque, Dusk Bisque, Amber Éclat and Sable Intense). All eight tones work to soften and diffuse light for a smooth and undetectable finish. 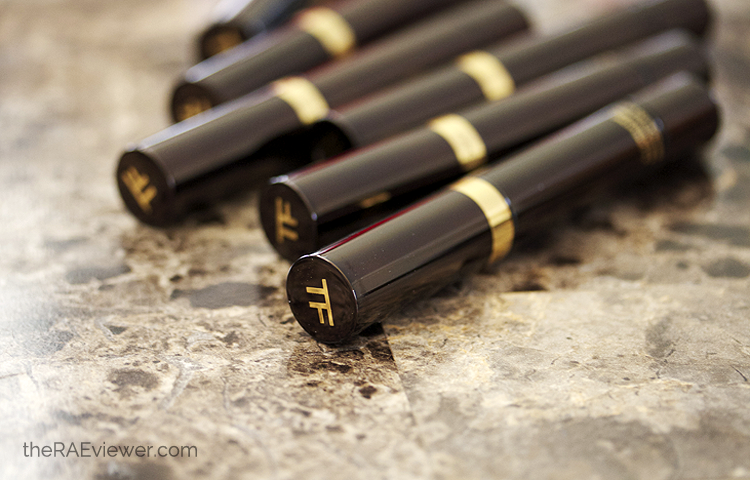 The packaging is luxurious.. the TF stamp and the mahogany with gold accents is consistent with the rest of the Tom Ford Beauty range. The white brushes are synthetic, soft and precisely the right length if you prefer to apply directly to the skin. It is a thicker, longer pen cartridge than many of the other highlighter pens that I own, but I prefer it because I no longer have to dig through all my face products in my makeup bags to find these. I did have to twist each pen approximately 20 times to release the product, but that is expected with any kind of twist-up packaging. 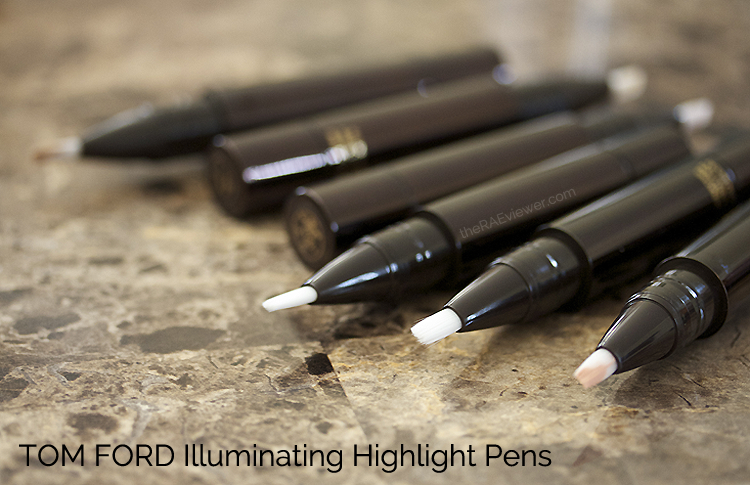 Each Tom Ford Illuminating Highlight pen will cost you $52. It is a lot more to shell out for when the similar and still phenomenal YSL Touche Eclat comes in at $40. I, however, prefer the Tom Ford at the moment because the YSL's Touche Eclat has rather minimal color coverage since it is a true complexion highlighter. 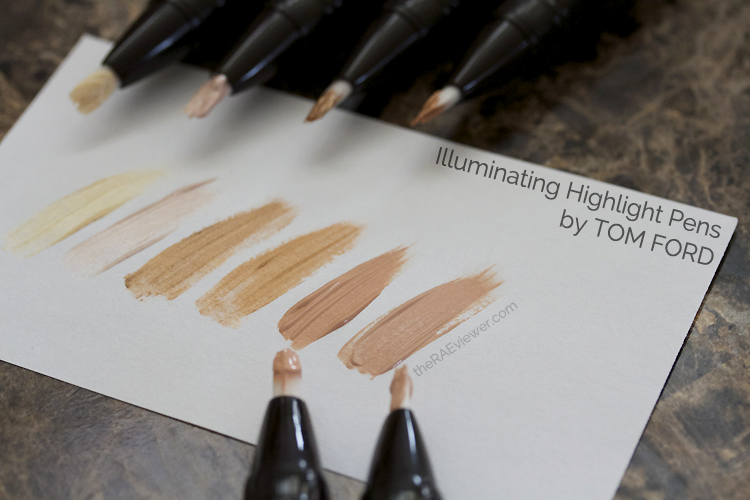 The creamier texture and denser pigmentation of the Tom Ford skin-priming concealer tones are more suited to my needs because of the reappearance of my dark circles. And the clincher? Once these set on the skin, they hydrate but do not migrate. Granted, I do not have oily skin but they last beautifully for 8 hours under my eyes. 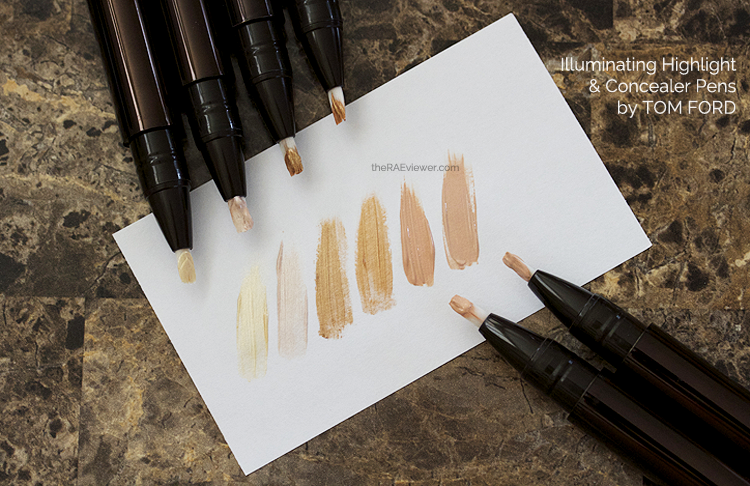 Application: I have read a couple reviews complaining the desired level of coverage in the concealer shades was not achieved. Firstly, these are not full coverage concealers so try not to have unrealistic expectations. 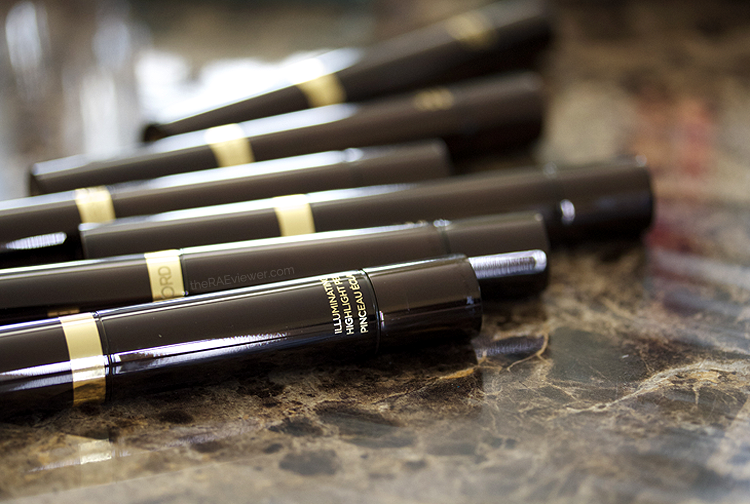 Think of it as an eye primer plus a medium coverage concealer in one product, making your morning routine less chaotic. My recommendation is to twist the back to the pen to release the product, pick the product up off the brush with a clean finger, and then pat down the product into the skin using your ring finger. Continue to pat until the product has leveled evenly across the surface of your eye. The key here is avoiding the temptation to swipe the product across your eyes! Also, do not go back to layer and attempt blending before the product sets because that will shift the product around. The two other concealer shades, which I do not have at my disposal, are 07 Amber Eclat and 08 Sable Intense. Currently, my favorite combination is 02 Lavender Voile and 05, which is the ideal light-medium concealer shade for my skin tone (Chanel 30). I prefer to layer the concealer shade over the highlighter shade to counteract my dark circles and achieve medium to full coverage. The combination sets beautifully and lasts all day, and in the summer, I will be able to switch up the concealer to 06 Dusk Beige (Chanel 40/MAC NC35-40 complexion equivalent). My least favorite shades are the 03 Peach Blush and 04 Liquid Bronze, simply because they are darker than I expect them to be, particularly the peach. I will use them in the summer, once I have significantly tanned, to highlight my cheekbones! And last but not least, Citrine is a great highlighter (cheeks, brows, lips) for all skin tones and no, it does not apply nearly as yellow on the skin as it does in the swatches above. All the shimmery shades (01 - 04) do contain various size of shimmer particles, some larger than one might expect. 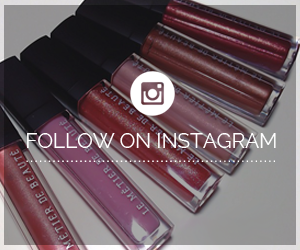 If you have large pores or despise shimmer that you can see sitting on the skin, these shades may not be for you. When I wear layer 05 over 02, however, the shimmer is no longer detectable. Cafe Makeup uses 07 Amber Eclat as a color corrector under concealer, and finds it even more effective than Armani's famed Master Corrector in #2. She also claims that she does not need to use as much concealer on top of the Amber Eclat because it simply performs that well. Since I have been experiencing dark circles again, now I am left wondering how 07 and 05 would look together! 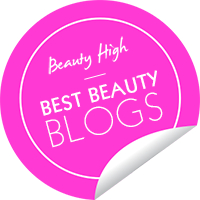 Bottom Line: I will be using my Naked Bisque and Dusk Bisque concealer pens all year round, and Lavender Voile is the first silky pink-based highlighter that I have fallen in love with since the release of Armani's Fluid Sheer in #7 eons ago! I think these are more similar to the By Terry counterparts. Does one need to mix two pens to get the correct shade? I wish you would show these on your face...or before and after you use them. Great review as always. Was looking up these swatches and found your, if you want to sell the two colors that you don't like, i'll be happy to take them off your hands! Overall loved all the swatches... but seriously contact me if you want to sell them.